This pass week was a short lived one. 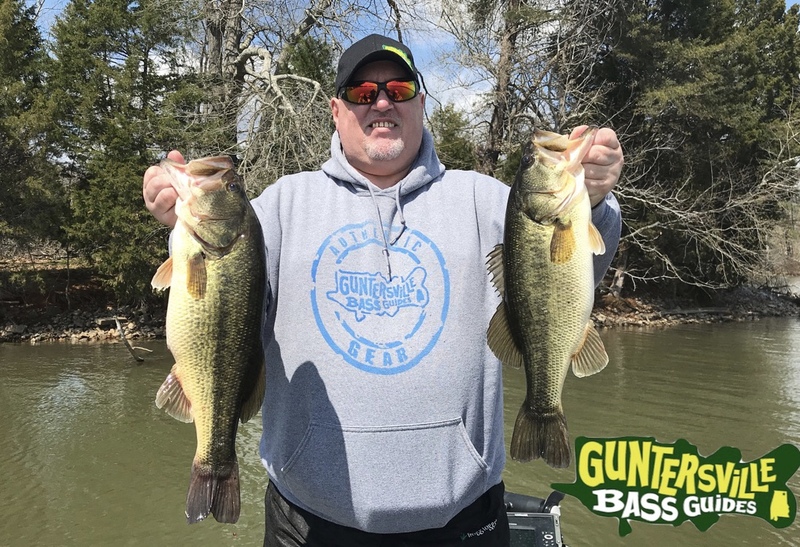 Nasty weather postponed Mondays trip, Tuesday and Wednesday was some of the best fishing I’ve seen ever and the rest of the week well lets just say I was not on Guntersville. 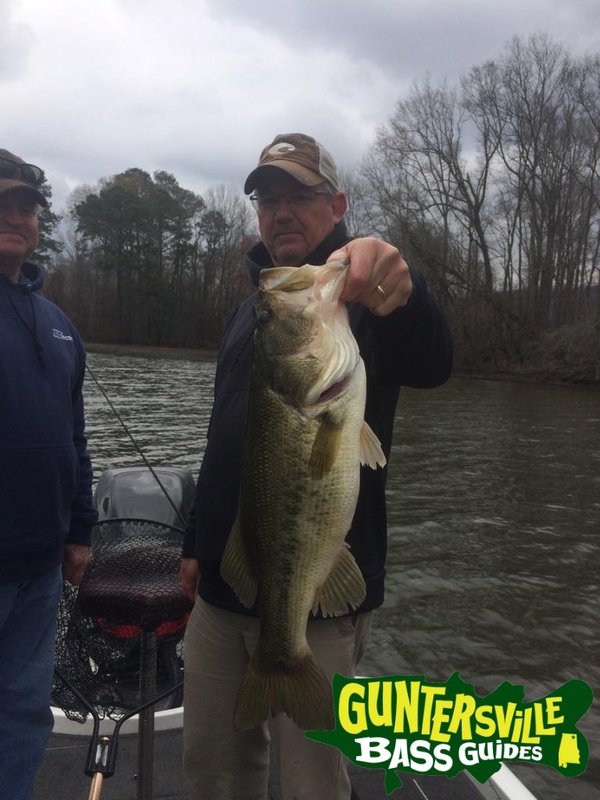 Fishing is the best I’ve seen on Guntersville! 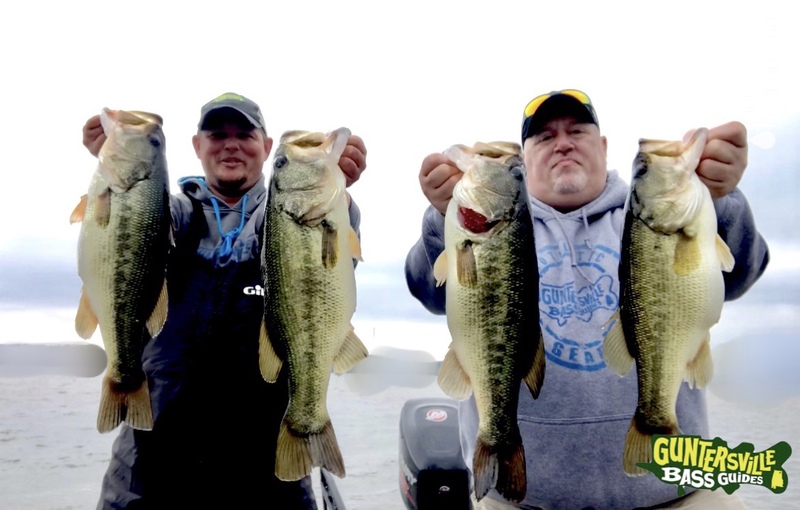 Mike Harvey joined me on Tuesday and Wednesday and we put them in the boat and they was big. 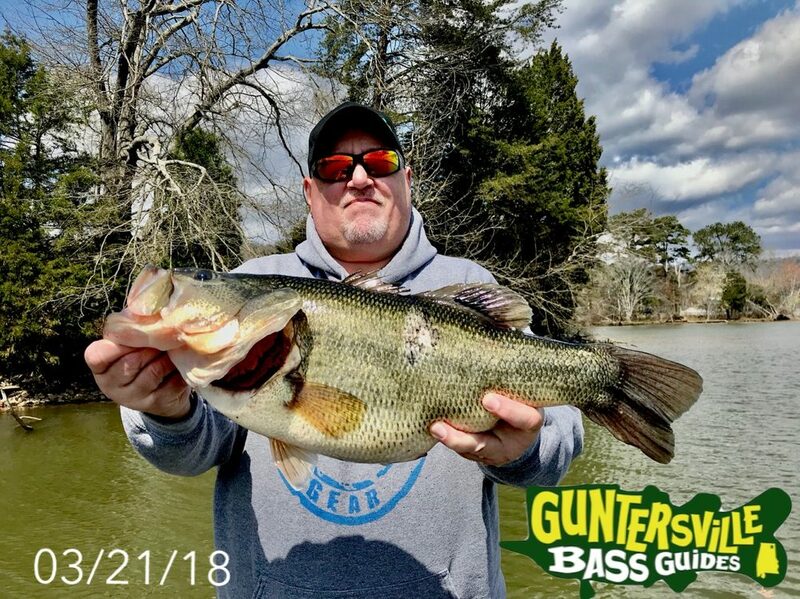 Tuesday we had over 50 bass ranging from 3lbs to 7lbs and its just not one little sweet spot it was game on wherever we stopped to fish..
Wednesday was a special day …. the wind was blowing insanely and the night before we talked and I felt that the big one was going to eat, and I felt it was going to be an early thing.. Well on the way to the ramp I was starting to regret my choice to go early, it was 30 degrees and 20+ mph wind. We left the dock and was getting wet from the wind blowing the splash off the side of the boat ( Mike had no idea how close I was to turning around and going to get breakfast and coming back later ) We went up in to a creek to where I knew it would be somewhat protected and that some big bass have been. Well in the 1st 30 mins Mike catches a 4 and a 6 and half we move down some with some luck nothing big so I fired the big motor up and motored us back up to where he caught the two bigger ones and with in mins he catches a 2lb bass then on the next cast on the same spot he hooks one that is doing whatever she wants and he is just along for the ride, few moments later that felt like hours she had him in the power poles (Power Pole Thank Your For Existing Without Them We Wouldn’t Of Been Able To Catch Fish Like We Have Especially This Month) and we still have not seen her, he worked her free from the poles then we get a boil and we now knew it was a bass and not a big trash fish, couple of seconds later we land her. 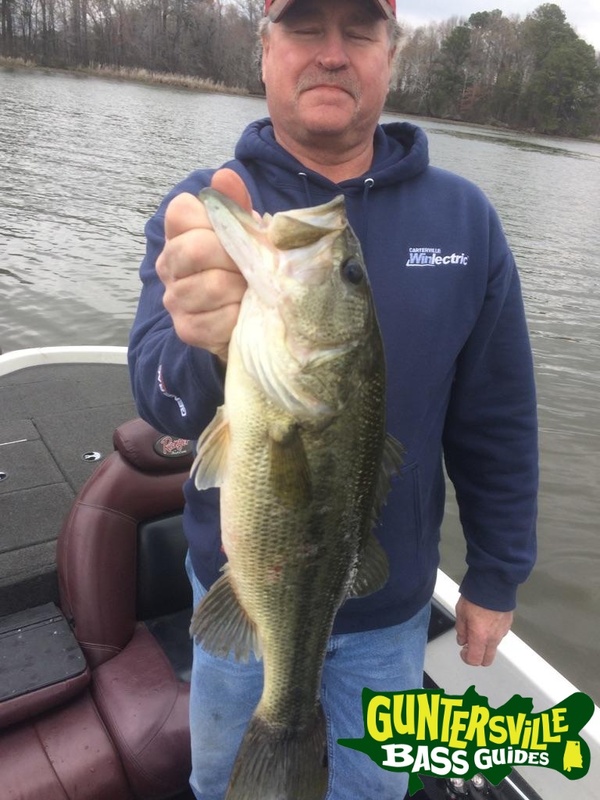 I looked the fish then Mike and told him I believe sir you just got your double digit…..We weighed her and sure enough she was a double digit…. Ok now what I’m about to share with you next is the impressive part.. This bass measured 24 1/2 inches long and 19 inches in girth. this fish was almost as big around as she was long.. crazy… She weighed 11-0 lbs this is the largest bass I have ever guided anyone to or even caught myself… And what really made it all that more special / rewarding… is that when Mike 1st hired me he told me ” I don’t really care about catching a lot of fish I want to catch big ones and I’d love to catch me a double digit” it took some time to get it done , now he has had his chance each year and they’ve somehow seemed to give him the slip, one in particular was two falls ago , she was big and like to waller on top, the first time she came up you couldn’t see the bait then by the 4th time she came up you could see just one hook in her and then she was gone..
Moving Baits and Bottom Draggin is our go to ! Heres some pics and the release video of the big girl..
Capt. Shane Took some pics of a couple of good ones from one of his trips last week.. There is not many days left open among myself and my guides. Not a sales pitch for one I do not like turning customers away at all, so if you know your coming then lets get it booked. Oh and I was on Wheeler Lake at the end of the week and It really made me Miss Gville..